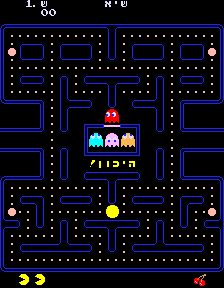 Pac-Man is an action game for the Arcade. 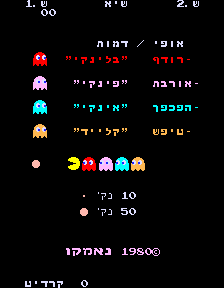 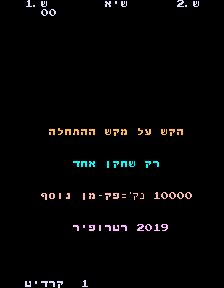 RetrOfir’s Hebrew translation of the legendary Pac-Man is the first ever ROM hack of the original Arcade Pac-Man to be released on ROMhacking.net, and the eighth Arcade translation there. 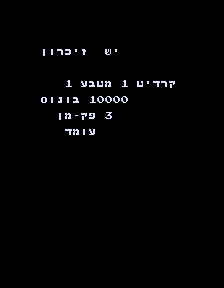 It is fully translated down to the game’s service mode and error message, and is based on the American version by Midway rather than Namco’s original “Puck-Man”, and thus, an American Pac-Man ROM is needed. 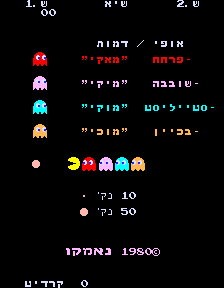 Note: While the ghosts’ nicknames were retained and translated from the American version, their characteristics were translated from the Japanese version, and the ghosts’ alternate nicknames, which were dummied out in Midway’s version, are now back and translated.